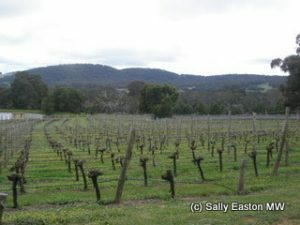 Alan and Nelly Cooper, of Cobaw Ridge, are doing really tasty things high up in the Macedon Ranges. Despite some challenging growing conditions, they’ve been minimising inputs for a while and have just (February 2012) joined (been vetted and approved by) the Return to Terroir / Renaissance des Appellations group of producers. This group of producers is not necessarily certified organic or biodynamic, but they work to a three tier ‘charter of quality’ aimed at avoiding additions and manipulations in both vineyard and winery, with the express purpose of more clearly reflecting the vineyard location (which one might equally call the terroir or the appellation). (4) French oak flavour, with a question mark, from the barrels in which he made the wines. Just 15% of them were new, and all of that was on the chardonnay. So really very few additions. 14%. Melon and allspice-poached peach. Silky palate attack of sweet fresh-creamy peaches with ginger note, full-fat alcohol sweetness comes through on the back palate. Lovely, elegant and pure fruits at the front, but I felt the alcohol knocked the flavours sideways just a bit on the back palate, without dominating the whole. Perhaps it was still settling into itself? When I tasted the 2008 in late 2010 it was seamless. 14%. Medium pale cherry colour; bright, lively fresh strawberry, raspberry and redcurrant fruits on the nose, fresh and perfumed. Pinot noir should always have a lovely fragrant nose, I reckon, and this one does. Crunchy fruit on the palate with a fine, chalk-dust tannin texture which is refreshing and supportive of those succulent and aromatic red berried fruits. The alcohol percentage is the same as the chardonnay, but it’s entirely seamless in the pinot noir. This is a lovely drink-me wine (what else should a wine be?). Bright, crunchy, lively, young, with fine tannin texture to support a few years in bottle, though why you’d want to I don’t know.